VietNamNet Bridge – MD Solid Waste Treatment Plant in central Quang Ngai Province has failed to meet emission standards, Minister of Natural Resources and Environment Tran Hong Ha has said. The technology line of the plant was incapable of cooling down waste from 1,200 Celsius to 300 Celsius, Ha said. This is a crucial part of the process to separate dioxin, a gas which could seriously pollute the environment and have negative effects on people’s health. 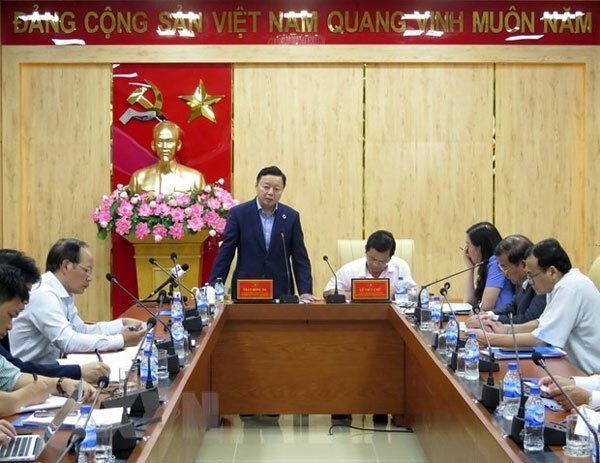 He made the statement at a working conference with provincial authorities on the pollution caused by the plant in Duc Pho District’s Pho Thanh Commune on February 25. Ha said the old landfill was not covered, causing serious pollution and failing to follow the regulations. He asked the plant to invest in covering the landfill and filling its bottom layer to limit the leakage of wastewater into the surrounding environment. Ditches for rain water must be built to prevent it from flowing into the landfill. Ha also said the plant should consider shifting to more modern technologies such as gasification and electrification, which were implemented at solid waste treatment centres in central Phu Yen Province. Ha said local authorities need to carefully calculate the locations for waste treatment plants, which must be far from residential areas. He urged the provincial Department of Natural Resources and Environment to review all landfills and waste treatment plants to solve complaints by residents. Inspection reports from the provincial People’s Committee showed that there were wrongdoings by both State agencies and the plant’s investor in the process of surveying and constructing the plant. The Department of Construction did not conduct the project evaluation according to the province’s plan. Duc Pho District People’s Committee and the Department of Planning and Investment did not report clearly to the provincial authority before it decided to approve the project. However, complaints from local people were not accurate. Local residents complained that the operation of the plant caused pollution. By that time, the plant had halted operations. The odour was from 2,500 cubic metres of waste which had been buried long ago at the factory site. The plant did not collect garbage from the city for treatment. The solid waste treatment plant was funded by MD Trading and Environmental Technology. The plant began construction in October, 2016 with investment capital of some VND60 billion (US$2.7 million). The plant covers an area of more than 20,000sq.m and has the capacity to treat 50 tonnes of rubbish per day. It is expected to treat all the rubbish from 15 communes and towns in the district. Local residents have continued complaining and blocking the road in protest. Dialogues were held but no solution was reached. The plant stopped operations in July, 2018.